Welcome to Wild Rose Summer Camp! Wild Rose Summer Camp is an outdoor educational camp providing children with an enthusiastic experience of the outdoors, coupled with a creative art program. Both are designed to nourish and strengthen, as well as enrich the growing child. 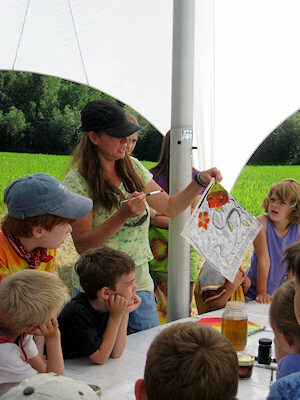 Wild Rose Summer Camp gives children quality experiences in art. The children will spend the mornings participating in art projects which will include felting, batiking, natural plant dying on silk, paper making from plants, tie-dying, block printing, pottery, copper work, candle dipping, marbling and silk screening. All projects involve working with high quality materials. Camp afternoons will be filled with games, hiking, puppetry, storytelling, garden study, beekeeping, and plant and bird identification and building small shelters from willow and alder. Children will also participate in building and cooking in an outdoor earthen oven. An earthen kiln will also be made and used to fire the pottery the children make throughout the camp session. The camps goal is to help each child develop an attitude of respect and wonder for the environment, along with a love of learning. The program is designed to promote confidence and self esteem in the child through the art experience. Camp is situated in a beautiful natural setting surrounded by a field and woods. All activities will be based out of tepees. Care is taken by our instructors to provide for the children a rich environment that brings nurturing, guidance, and cooperation where imagination and creativity will flourish.